For me, nothing quite beats home-made pizza on a Friday night. It's something I look forward to after a long, hard week at work. Food to enjoy cuddled up on the sofa with a beer and a film. Perfect. Yet shop bought, or takeaway never gives me quite the same feeling. 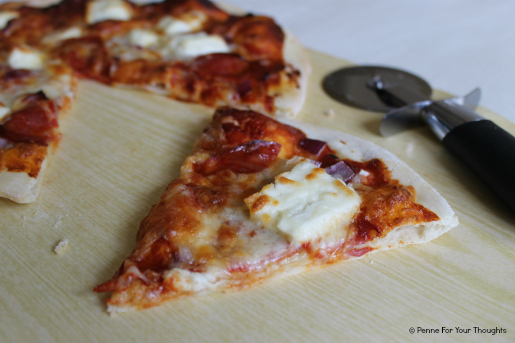 There's something so lovingly made about hand-crafted pizza dough and guys it is SO EASY to make. Once you've done it once, I promise you won't go back! Now on to toppings. For me, on a pizza, the simpler the better. 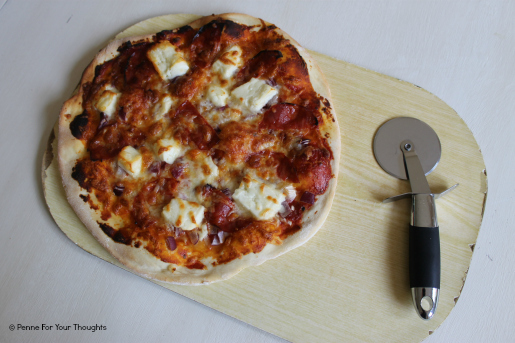 The combination of chorizo, halloumi cheese and red onion topped with mozzarella is bursting full of flavour and texture. The spiciness from the chorizo, the gooeyness of the halloumi and the sweetness from the red onion, it really is a party in the mouth. 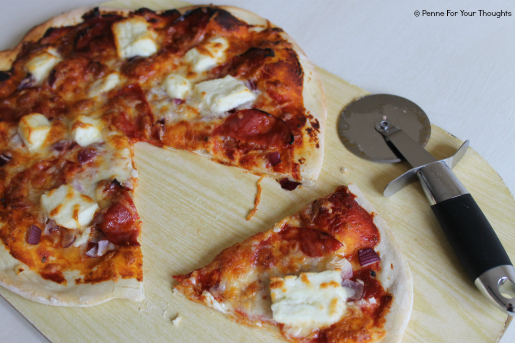 I've tried a few different celeb chefs pizza dough recipes, and have decided that Paul Hollywood's is my favourite. It's simple to make, and never fails. Plus it creates a perfectly thin base, which bakes lovely in a regular fan oven. 1. For the pizza dough, put the ingredients in a bowl with 150ml of the water. Start to mix together using your hands, adding a little more water as required until well combined and all together. 2. Tip the dough onto a slightly oiled surface and knead for 5-10 minutes until smooth and elastic. Shape into a ball and put into a slightly oiled bowl. Cover with a tea towel and leave somewhere warm for 1-2 hours, until doubled in size. Meanwhile preheat the oven to 220c. 3. Divide the mixture into three balls, wrap one of these in clingfilm and pop in the freezer for a later date! Roll the remaining two out on a floured surface, as thin as you can get. Put a little flour on your baking tray, and transfer the rolled out dough to it. 4. To make the pizza sauce, mix together all of the ingredients and then divide evenly between the two bases. Spread out using the back of the spoon until covered except a thin border around the edge. 5. Add half the mozzarella, then add the chorizo, halloumi and red onion. Top with the remaining mozzarella and bake in the preheated oven for around 10 minutes until the dough is crisp and the cheese is golden and bubbling. If you're looking for a healthier or gluten free option, check out this cauliflower pizza from Emily's Recipes and Reviews.